His cabinetry features both traditional and contemporary styling for residential or commercial use. He stays updated in trends, styles and construction methods. His motto has always been “Quality, Because We Care”. Believing there will always be a market for superior skills and craftsmanship, he strives to produce an exceptional product. Jim does this along with a team of skilled craftsmen that work together in a fully equipped 8,000 sq. ft. shop. He builds, finishes, and supervises construction of his cabinetry for that in-house quality control that his customers have come to expect. Jim also offers computerized design service. He works with architects, designers, and individuals to make their ideas form and function with artistic beauty. You no longer need to wonder where to get fine quality design and custom cabinetry. We cannot say enough positive things about Jim Farris! He saved our kitchen from being a remodeling nightmare into being the beautiful, high-end kitchen with the most impeccable craftsmanship we have seen to date! He was timely, professional and a general pleasure to be around! An honest business with the highest quality and attention to detail we have seen. Hire Jim and you won't be disappointed, you will be absolutely thrilled! We have been working with Jim Farris Cabinets for several years. Their quality of work is second to none with a high degree of professionalism from, not only Jim, but his crew as well. Telephone calls and emails are always returned promptly. Jim is also very good at catching details in the design that can be improved upon, making sure chosen appliances, plumbing fixtures, etc., work with the application. We at Dovetail Builders, Inc. highly recommend Jim Farris Cabinets. 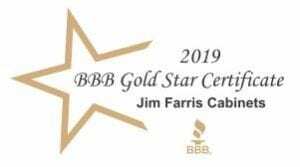 “Jim Farris Cabinets does outstanding work. We began our remodel with another contractor who was unable to deliver a final product. I found Jim through an internet search. I knew from our first meeting that he took his work seriously and cared about getting the details right. Mike and I want to thank you so much for our beautiful kitchen!! Of all the people we have dealt with in our home building process you and your team are by far the BEST of the BEST. Your attention to detail, excellent experience, high quality craftspeople, make your work truly outstanding. Jim Farris custom designed & built wine racks & bins for my 14' X 12' wine room. His work was all top quality and done on time and on-budget. Jim has been building cabinets for us for about 30 years. His workmanship, precision and attention to detail are amazing. His cabinets have stood the test of time and four active kids. We keep coming back to him because no one does it better! We have used him in multiple rooms for several homes. I'd recommend you without hesitation. Really first-rate quality and the ability to come up with exceptionally inventive solutions to design problems. Feel free to use me as a reference.